– In the Bible, God’s Word, we are told to keep certain Holy Feasts f o r e v e r.
– Who is supposed to be keeping these Holy Feats? – Anyone and everyone who chooses to follow the Creator of Heaven and Earth. – HE is the One who put these feasts in place, to be kept F O R E V E R.
– Are you in or are you out? In this episode of Hebrew Voices, An Early Christian Passover, Nehemia Gordon continues his fascinating discussion with Prof. Shaye Cohen of Harvard University. Thank you Nehemia Gordon for allowing me to share this talk. Also read Passover special and From Slavery to Freedom and What is the difference between Easter and the Passover? Categories: A BIT OF EVERYTHING, GOD'S HOLY FEASTS | Tags: An Early Christian Passover, Easter, Hebrew Voices #68, Nehemia Gordon, Passover, Prof. Shaye Cohen | Permalink. Post from Nehemia Gordon, Find the full post here. On Chag Ha-Sukkot, Feast of Booths (Tabernacles) we are commanded to build a Sukkah (Booth) using as building materials the “4 species” listed in Lev 23:40. Rabbinical tradition teaches that a bundle of these building materials must be ritually waved in the air during the festival. 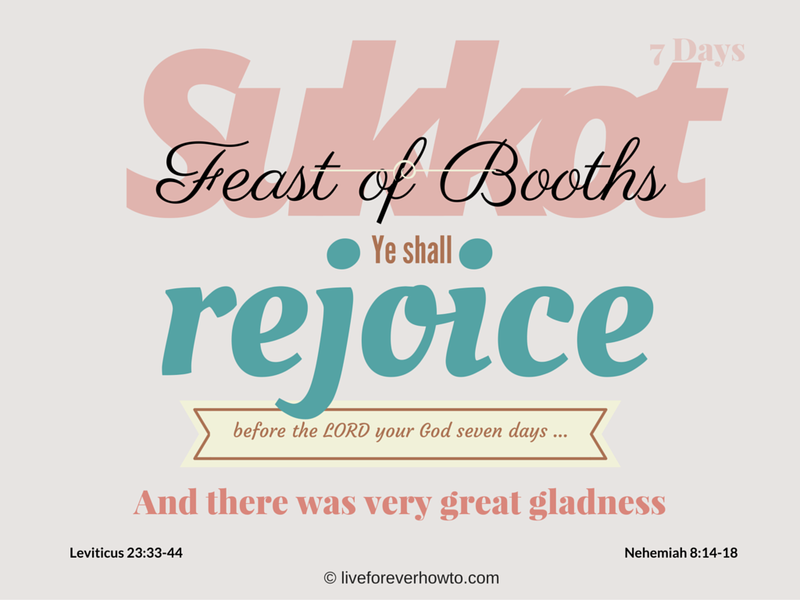 We’re commanded to celebrate the Feast of Booths (Chag Ha-Sukkot) for seven days, from the 15th to the 21st of the Seventh Hebrew month. This holiday is also known as the “Feast of Tabernacles”. Work is forbidden on the first day of the seven days. Visit Nehemia’s Wall to read the complete post. Thank you Nehemia! Feast of Booths is a lot of fun. We cut palm fronds and olive and eucalyptus branches and decorate our veranda with this. With Sukkot we remember and celebrate the years that the Jewish people spent in the desert on their way to the Promised Land. We recall the ways that our Father protected them whilst they traveled through the desert and lived in tents. More information on Sukkot from our friends at Chabad Org. Categories: A BIT OF EVERYTHING, GOD'S HOLY FEASTS | Tags: Feats of Booths, God's Holy Feast, Holy Feast days, Leviticus 23, Nehemia Gordon, Shemini Atzeret, Sukkot | Permalink. Post from Nehemiah Gordon. Find the full post here. On the 1st day of the Seventh Month (Tishrei) the Torah commands us to observe the holy day of Yom Teruah which means “Day of Shouting” (Leviticus 23:23-25; Numbers 29:1-6). Yom Teruah is a day of rest on which work is forbidden. One of the unique things about Yom Teruah is that the Torah does not say what the purpose of this holy day is. The Torah gives at least one reason for all the other holy days and two reasons for some. The Feast of Matzot (Unleavened Bread) commemorates the Exodus from Egypt, but it is also a celebration of the beginning of the barley harvest (Exodus 23:15; Leviticus 23:4–14). The Feast of Shavuot (Weeks) is a celebration of the wheat harvest (Exodus 23:16; 34:22). Yom Ha-Kippurim is a national day of atonement as described in great detail in Leviticus 16. Finally, the Feast of Sukkot (Booths) commemorates the wandering of the Israelites in the desert and is also a celebration of the ingathering of agricultural produce (Exodus 23:16). In contrast to all these Torah festivals, Yom Teruah has no clear purpose other than that we are commended to rest on this day. Go to Nehemia’s Wall to read the complete post. Thank you Nehemia! Categories: A BIT OF EVERYTHING, GOD'S HOLY FEASTS | Tags: Nehemia Gordon, Psalm 47:3, Yom Teruah | Permalink. Categories: A BIT OF EVERYTHING, GOD'S HOLY FEASTS | Tags: Holy Feast, Nehemia Gordon, Rabbi Dr. Abraham J. Twerski, The Passover | Permalink. Another Feast of the Lord is Sukkot, which is also known as the Festival of Tabernacles and Feast of Booths. Well, all those years ago for all sorts of different reasons, people didn’t celebrate God’s festivals as they were supposed to. One of those reasons for not celebrating God’s feasts was intermarriage. This meant that the Jewish people adopted the customs and religions from the nations around them. I can relate to this because I was raised a Catholic and then married into a different religion. During this time the practice of my faith suffered much. My husband didn’t agree to marry in the church before God and suffice it to say that, in those days, I must have loved my husband more than I loved my Creator. To my credit I taught my children about Jesus. To my shame, this is called syncretism and this is exactly what the Jewish people at the time were guilty of; mixing and mingling religions and faiths instead of being faithful and loyal to the One. At the time it did not seem a biggie to me to be married to someone of a different faith. And indeed, if I could have stayed loyal and continued to follow God’s rules … That didn’t happen however and therein lies the problem. HE took me back. I’m happy to report that, according to His promises, God took me back and I have returned to my first love. Yeah! It is mentioned in the Book of Ezra that intermarriage was a problem. This was because other faiths adhered to practices such as child sacrifice which obvisouly was/is against God’s law. Due to the mixing and mingling of different faiths and cultures, God’s directions and commandments weren’t followed. And it is mentioned that ‘since the days of Jeshua the son of Nun unto that day had not the children of Israel done so.’ For hundreds and hundreds of years the Feast of Sukkot had not been celebrated. And they found written in the law which the Lord had commanded by Moses, that the children of Israel should dwell in booths in the feast of the seventh month: And that they should publish and proclaim in all their cities, and in Jerusalem, saying, Go forth unto the mount, and fetch olive branches, and pine branches, and myrtle branches, and palm branches, and branches of thick trees, to make booths, as it is written, So the people went forth, and brought them, and made themselves booths, every one upon the roof of his house, and in their courts, and in the courts of the house of God, and in the street of the water gate, and in the street of the gate of Ephraim. And all the congregation of them that were come again out of the captivity made booths, and sat under the booths: for since the days of Jeshua the son of Nun unto that day had not the children of Israel done so. And there was very great gladness. When the Jewish people realised that they had mucked up and not followed God’s law and directions as they were supposed to, they became desponded and remorseful. and the Levites that taught the people, said unto all the people, This day is holy unto the Lord your God; mourn not, nor weep. For all the people wept, when they heard the words of the law. Then he said unto them, Go your way, eat the fat, and drink the sweet, and send portions unto them for whom nothing is prepared: for this day is holy unto our Lord: neither be ye sorry; for the joy of the Lord is your strength. So the Levites stilled all the people, saying, Hold your peace, for the day is holy; neither be ye grieved. And all the people went their way to eat, and to drink, and to send portions, and to make great mirth, because they had understood the words that were declared unto them. The Levites (priests) told the people not to worry, but be happy and celebrate and do better from now on. With all this history in mind we realise that the Feast of Booths is an awesome Feast! It reminds us of God taking care of His people whilst they were in the desert. It reminds us to love the stranger and take care of refugees. It tells us to celebrate and share Good Harvest and give thanks for the blessings bestowed upon us. It reminds us of God’s forgiving spirit and willingness to give us another chance. Wishing that you shall have nothing but joy! Ve-hayita akh same’aḥ! וְהָיִיתָ אַךְ שָׂמֵחַ Wishing that you shall have nothing but joy! ABOUT SCRIPTURE CARDS – If you want to send free Scripture Cards to your friends click here and you you want to buy hard copies of Scripture Cards you can click here. To download a free copy of my Story of Survival click here. Categories: A BIT OF EVERYTHING, GOD'S HOLY FEASTS, LIVE FOREVER | Tags: Book of Nehemia, Feast of Booths, Feast of the LORD, Festival of Tabernacles, Leviticus 23, Sukkot, Ve-hayita akh same'aḥ | Permalink.